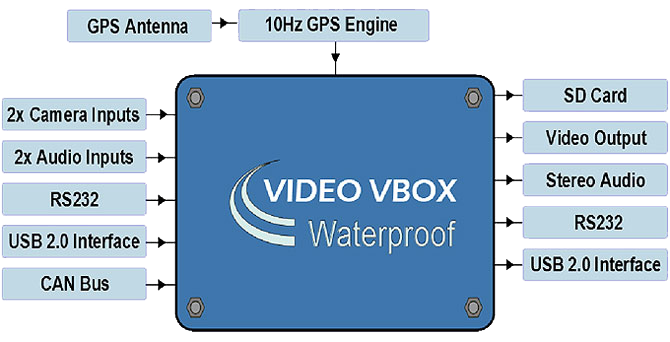 In car camera system designed for open top race cars and any environment which exposes your vehicle to showers. 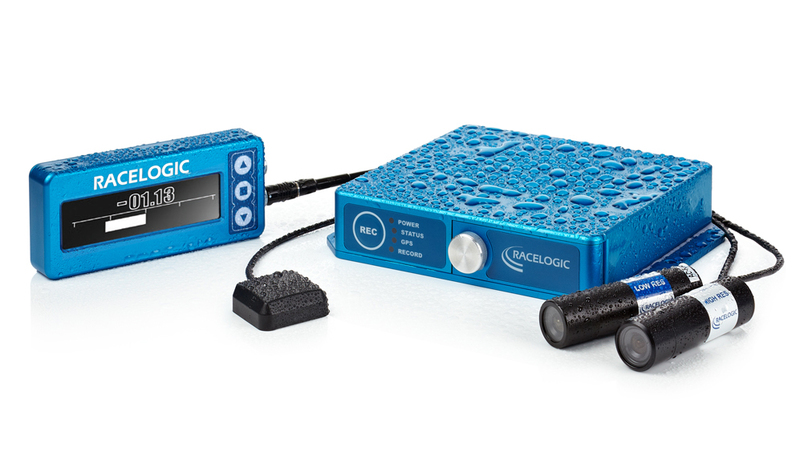 Housed in a water resistant casing, Video VBOX Waterproof incorporates a flange and mounting holes to allow you to bolt the data logger anywhere on the vehicle. The sturdy aluminium casing is ideal for motorsport applications and racing environments. Predictive Lap Timing gives you an invaluable insight into how your current lap time compares with your fastest lap time. To achieve our unrivalled accuracy, we compare two different laps using GPS position rather than distance. This means our lap time stays accurate, even if the driver takes a different line each lap. 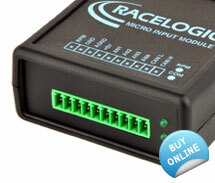 More about Predictive Lap Timing. 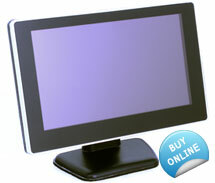 The OLED display is available as an accessory or as part of a Video VBOX package. Check the online store for our attractive package deals. 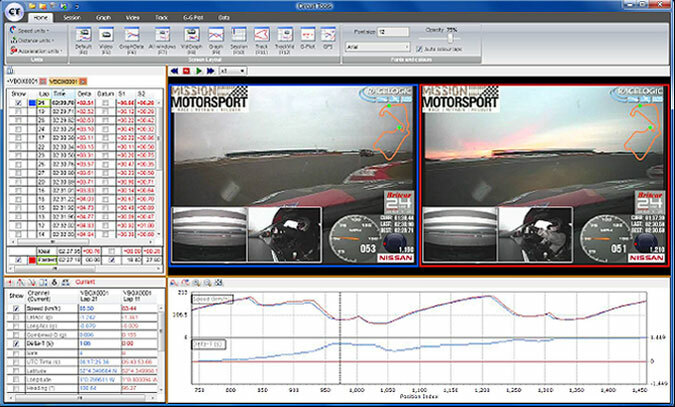 Circuit Tools software is a Windows based data analysis package that comes with Video VBOX, VBOX Sport, DriftBox and PerformanceBox. The software is designed by racing drivers, for racing drivers, with none of the complexity normally associated with analysis software. To analyse your track data, simply insert the SD card with your recorded video and synchronised data into your PC and select a file. 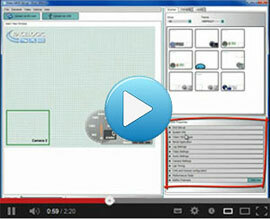 Video VBOX Setup software (Windows) allows you to create scenes from scratch or edit the default scenes provided, adding bar graphs, rotary gauges, text elements, pictures and track maps. A large library of scenes, gauges and g-force meters are available to download. We offer two different camera mounts affixed to a roll cage via a velcro strap. The mounts are made of soft polyurethane that effectively dampens vibration. The 3.5" camera preview monitor is ideal for aligning camera angles and checking the output from the in-car cameras. Should you wish to log vehicle signals from a car without a CAN Bus, the Micro Input Module allows you to record one frequency (RPM) and four analogue signals. For vehicles requiring a bare-wire CAN Bus connection, this neat item encloses the CAN-hi and CAN-lo cables without breaking into them, inductively reading the signals. The Li-Ion battery gives approximately five hours of power from a full charge. Hi-res and lo-res cameras are available as accessories, which is convenient if the Video VBOX is used in more than one vehicle. If you need manual logging, the start/stop logging switch allows you to remotely operate the Video VBOX. Also available with a remote USB logging socket and OLED Display connection. Various cables for remote USB logging, camera extension, OBDII or CAN connection. *95% CEP (Circle of Error Probable) means 95% of the time the position readings will fall within a circle of the stated radius. **Not using DGPS and crossing the start/finish line at 100km/h. Standard library of gauges, fonts etc. User definable gauges, fonts, etc. Software: Lifetime Support Contract. Valid for a minimum of 5 years from the date of purchase and limited to the original purchaser. Contract includes: telephone/ email technical support provided by local VBOX Distributor and firmware/ software upgrades (where applicable). Last year McLaren GT launched the 12C GT Sprint, a track-only version of the 12C, to satisfy the needs of a proportion of their enthusiastic clientele who frequent track days. What kind of customer buys a 12C GT Sprint? It is likely to be someone who already owns a standard road-going car but doesn't want to use it on the track. And increasingly, it will be somebody who, whilst they don't necessarily want to go down the path of a full-blown GT3, will be pretty serious about their circuit performance. 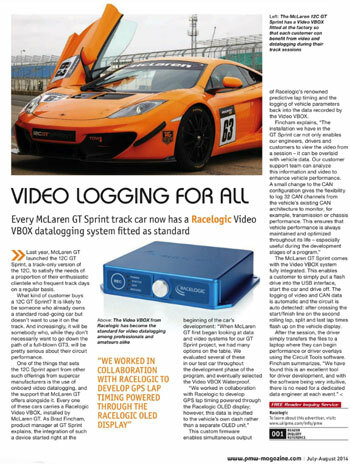 One of the things that sets the 12C Sprint apart from other such offerings from supercar manufacturers is their use of onboard video data logging, and the support that McLaren GT offers alongside it. Every one of these cars carries a Racelogic Video VBOX, installed by McLaren GT. "When McLaren GT first began looking at data and video systems for our GT Sprint project we had many options on the table. We evaluated several of these in our test car throughout the development phase of the programme, and eventually selected the Video VBOX Waterproof." 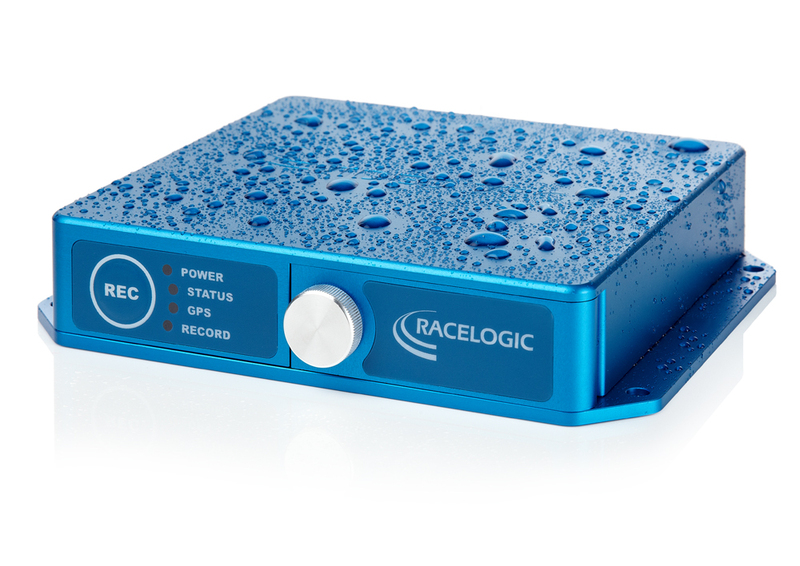 "We worked in collaboration with Racelogic to develop GPS lap timing powered through the Racelogic OLED display, however this data is inputted to the vehicles own dash rather than a separate OLED unit." "The installation we have in the GT Sprint car not only allows our engineers, drivers, and customers to view the video from a session - it can be overlaid with vehicle data. Our customer support team can analyse this information and video to enhance vehicle performance. A small change to the CAN configuration gives the flexibility to log 32 CAN channels from the vehicle's existing CAN architecture to monitor, for example, transmission or chassis performance. This ensures that vehicle performance is always maintained and optimised throughout its life – especially useful during the development stages of a programme." The McLaren GT Sprint comes with the Video VBOX system fully integrated. This allows a customer to simply put a flash drive into the USB interface, start the car and drive off. The logging of video and CAN data is automatic and the circuit is auto detected: after crossing the start / finish line on the second rolling lap, split and last lap times flash up on the vehicle display. After the session, the driver simply transfers the files to a laptop where they can begin performance or driver overlays using the Circuit Tools software. "We have found this is an excellent tool for driver development, and with the software being very intuitive there is no need for a dedicated data engineer at each event."